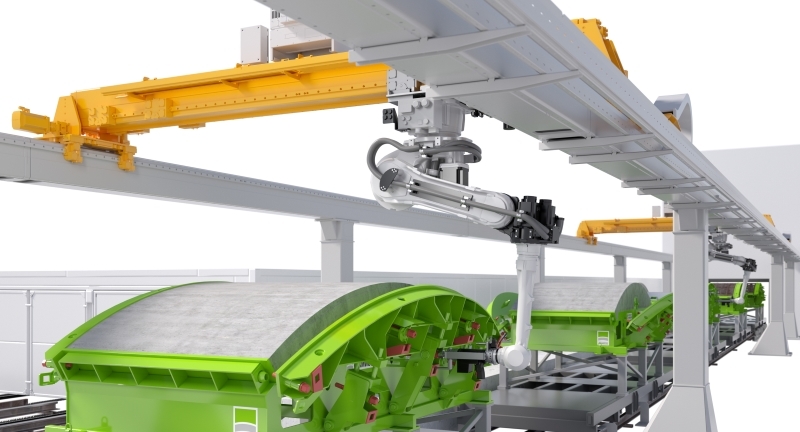 As a manufacturer of precast concrete elements, the Swiss company Marti AG and Herrenknecht Formwork as a supplier of segment moulds and segment production equipment brought together their experience and know how and developed an innovative automated working line using robots. The result is impressive - a robot working on several stations of the working line and thereby performs important tasks safely, without errors and with constantly high quality. The robot system designed by Herrenknecht Formwork and Marti works hanging from a crossbeam, which, with high rigidity, moves on a portal along the entire work line. The robot opens and closes the mould, cleans the moulding surfaces, applies separating agent and installs the inserts. Due to their simplicity and yet high requirement for accuracy, these activities are predestined for the use of robots. Besides maximum precision, the high degree of automation of the Herrenknecht Formwork systems offers high flexibility. All processes and components can be adapted to the special projects and can be re-used. Installation of the steel portals does not require any special measures referring to foundation works: a standard ground plate is sufficient. Production of the bottom segments for the project „HWS Sarnen" in Switzerland is about to start next month. Currently the robot will be teached, i.e. it will be prepared in detail to carry out its segment production works in order to quickly set a new milestone in the field of segment production. Visit us on the Bauma in hall C3, booth n° 547 and get more information on ROBOT SUPPORTED MOULDING!